NASA's NEOWISE asteroid survey indicates that there are at least 40 percent fewer near-Earth asteroids in total that are larger than 330 feet, or 100 meters. NASA used its WISE infrared space telescope to make the find. This story was updated at 2:25 p.m. EDT. A NASA space telescope that meticulously mapped the entire sky has found fewer potentially dangerous asteroids that orbit near Earth, space agency officials announced today (Sept. 29). The discovery significantly lowers the number of medium-size asteroids near Earth to 19,500 — nearly a 50 percent drop from the 35,000 space rocks initially estimated — and suggests that the threat to Earth by dangerous asteroids may be "somewhat less than previously thought," NASA officials said in a statement. Still, there are thousands more of these asteroids, which can measure up to 3,300 feet wide, that remain to be found. Additional research will also need to be conducted to determine if fewer medium-size asteroids also means fewer dangerous asteroids that could pass hazardously close to Earth, NASA officials said. Asteroids measuring about 460 feet (140 meters) wide can cause widespread damage around their impact sites, but much larger space rocks would have to strike Earth to cause global devastation, scientists have said. 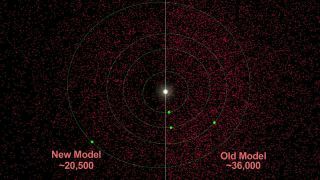 NASA's Wide-field Infrared Survey Explorer (WISE), an infrared space telescope, mapped the asteroid population near Earth and elsewhere in the solar system. The asteroid survey, which NASA says is the most accurate ever performed, also lowered the estimated number of giant near-Earth asteroids — space rocks the size of a mountain or larger — from 1,000 to 981, with about 911 of those already known, researchers said. By the end of the WISE telescope's extended mission, called NEOWISE, last year, astronomers had found 90 percent of the largest asteroids near our planet, NASA scientists said, which met the goal that was set forth by Congress in 1998. This chart illustrates how infrared is used to more accurately determine an asteroid's size. "NEOWISE allowed us to take a look at a more representative slice of the near-Earth asteroid numbers and make better estimates about the whole population," Mainzer said. The telescope's NEOWISE mission discovered more than 100,000 previously unknown asteroids in the asteroid belt between the orbits of Mars and Jupiter. It spotted 585 asteroids in orbits that brought them near Earth. NASA launched the $320 million WISE telescope in December 2009. It spent 14 months scanning the heavens in infrared light before the agency shut it down in February 2011. As part of NASA's future direction, the Obama Administration challenged the agency to send astronauts to an asteroid by 2025, followed by a manned mission to Mars by the mid-2030s. The agency recently announced its plan to launch a sample-return mission, called Osiris-Rex, to an asteroid in 2016. The $800 million mission will rendezvous with a potentially dangerous asteroid, known as 1999 RQ36, in 2020, collect samples and return them to Earth in 2023. Scientists are interested in asteroid 1999 RQ36 because it is packed with carbon-based compounds, which make up the building blocks of life as we know it. By studying samples from the space rock, researchers could gain more insight into how life originated on our planet, in addition to understanding how to better prevent or mitigate asteroid collisions with Earth. Today's announcement could help NASA planners shape the Osiris-Rex mission, said Lindley Johnson, Near-Earth Object (NEO) program executive at NASA Headquarters in Washington. "We're working with the human spaceflight folks in examining the known population of near-Earth asteroids to determine if there are available targets," Johnson said. "[NEOWISE] has allowed us to understand the population of these objects much more and understand where we could find more available targets."